The music ministry at Grace exists SOLI DEO GLORIA, to the glory of God alone, to support the various other ministries and programs of a supporting, singing, and loving congregation. 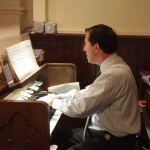 The planning and execution of instrumental and vocal music follows the liturgical calendar, with thoughtful consideration given to important events in the life of the parish, to provide music appropriate to the season and the scripture — music to augment and enliven the delivery of the Gospel message through robust participatory singing of hymns and psalms as well as for prayerful reflection and meditation. ​The responsibility duty of the all-volunteer choir is to sing and carry on for God, for members of the congregation, and “for themselves.” Its members comprise volunteers ages 18 to infinity who offer faithful and loyal service in singing praise to God. The Adult Choir sings every Sunday at the 11 am worship service and offers special music on Ash Wednesday, Maundy Thursday and Good Friday of Holy Week, and during Easter, Advent, and Christmas. Rehearsals are at 9:30am on Sunday mornings and at 7pm on Thursday evenings (except in the Summer when we meet only at 10am on Sundays). For more information about what’s entailed or how to get involved, contact the Rector or the Director of Music. I welcome your involvement and suggestions.